This Mirage comes up short!! Automakers like to develop and build cars that are global platforms, with appeal to several markets. But Bumper2Bumpertv finds that Mitsubishi did not put its best effort forward with the Mirage. LENGTH X WIDTH X HEIGHT: 182.7 x 70.9 x 56.5 in. CARGO CAPACITY: 15.3 cu. ft.
BOTTOM LINE: The all-new Kia Forte is a cable compact sedan with a comfortable ride. 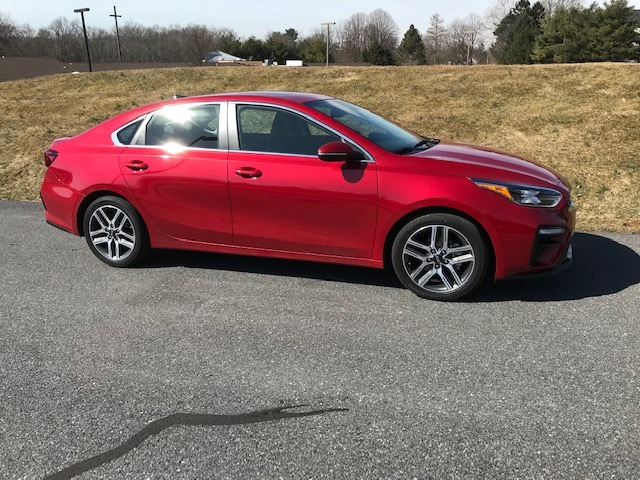 The 2019 Kia Forte has been redesigned, making Kia’s compact car into - officially - a mid-size. To use the current hot term, it’s a cusp mid-size. Overall length for the Forte has grown by 3.2 inches to 182.7 inches on the same 106.3-inch wheelbase, with the big advantage gained in rear seat legroom, which is pretty decent, depending on the positioning of the front seat. For example, where I position the seat for comfortable driving, there’s about an inch or two in front of my knees when I sit in the back. Behind my wife’s seat, however, the knee room is tighter, because she likes to sit further away from the dash. Cargo capacity is also increased from the former model, and is now up to 15.3 cubic feet with the rear seat backs up. The seat backs fold easily with trunk-mounted releases. The Forte is powered by a 2.0-liter four, that its basically unchanged from the previous model and delivers 147 horsepower. Power reaches the front wheels through what Kia calls an Intelligent Variable Transmission, which is basically a smart CVT. Performance is decent. The engine is relatively quiet. Yes, it buzzes on hard acceleration, but in cruise mode it doesn’t make a lot of noise. Fuel economy is excellent. We averaged more than 31 mpg overall on our test that didn’t include a lot of highway mileage. We took the Forte on one of our favorite hill climb routes and it proved to be a fun drive. Handling is good, as are the brakes. Front seats are comfortable with some side support. Our tester had power adjustable seats for the driver, but my wife had trouble getting her manual seat to a comfortable setting. Rear seat room is okay, as I said, depending on front seat position. The driver faces a simple instrument panel with a tachometer, speedometer, fuel and water temperature gauges. I had the central information panel set to a digital speedometer, which was handy. In the middle of the dash is a clear infotainment screen. The default screen is a map on the left and audio information on the right. Our tester didn’t have SiriusXM hooked up, so I switched to my old favorite FM stations. Sound quality was good. We remained comfortable through all our drives thanks to heated seats and an excellent HVAC system. Safety systems consist of a blind spot monitor, lane departure warning and rear cross traffic alert. All were helpful, sometimes too helpful. For example, the blind spot monitor yelled at me when I signaled to change lanes and it detected a vehicle there. Okay, that was a good nag. Internal storage consists of a deep cubby at the base of the center stack with USB, AUX and 12-volt connections. Above this cubby is a shelf with a Qi wireless charger. Overall ride quality for the Kia Forte is good. There is some highway roughness felt in the cabin but it isn’t intrusive. One of the Forte’s more unique features is the key fob. Its has the standard lock and unlock buttons, but rather than being on the face of the fob, they’re on the edge. While it’s officially listed as a midsize, the Kia Forte is, in reality, a large compact, making it gain in practicality. Minimalist Luxury, the Lexus UX 250h. >br> Lexus has made a pivot with its small crossover offerings. The UX, a vehicle intentionally focused on city drivers, is the latest small crossover from the brand. Bumper2Bumpertv takes a first close look.